New technology has made it possible to use a state-of-the-art digital format, whereby images can be scanned in or transmitted electronically into memory to be stored for further use. Data only needs to be input once, reducing much of the pre-press setup time involved in traditional printing methods. This reduction of time reduces the cost of your printing job and your job is completed more quickly. Copytex uses digital machines to achieve superior quality. 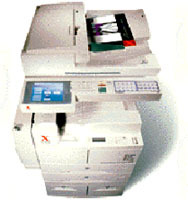 The additional benefit over analog machines is that the original is scanned once, printed many times and collating and book-making features are done automatically. The XeroxDocuCentre400 delivers solution that utilize intelligent digital technology, unparalleled quality, valuable features and outstanding productivity. Our machine can print on individual sheets, manuals or reports with 40 copies per minute printing speed. Copying sizes from A4 (210x297mm) to A3 (297x420mm) are possible. Reduction and enlargement capability ranges from 25% to 400%. With our Print-On-Demand Digital Systems your complex documents such as books, manuals, proposals or product booklets are input and assembled into final layout and printed at 600x600 dpi up to 2400 dpi using edge enhancement superb image quality, your documents come out looking on their best.